One of the programs that links Midday Rotary to the broader world of Rotary International is the Rotary Exchange Student program. In recent years the Midday Club has enjoyed hosting exchange students from Poland, Turkey, and Chile. With each inbound exchange student, we also send a local student outbound. This year, our outbound student is in Italy while we host our inbound student from Cozumel, Mexico. Zianya Vizcaino, has been an absolute delight for our club. 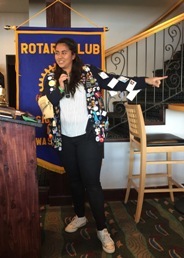 Full of enthusiasm and very engaged in culture, Zianya speaks to the club each week about her adventures and life experience in Western Washington, and teaches us about life in Mexico. She even helped plan and present a local version of the major Mexican holiday “Dia de los Muertos” as a club social event. Her father is a Rotarian in Cozumel. Zianya spends 3-4 months each with different local Rotarian host families in her yearlong adventure with us. Next year we will be sharing an exchange student from Norway with the Gig Harbor Morning Club, as we send our outbound student to Hungary.